Ah, the end of Deuteronomy—the end of the “Five Books of Moses.” The major books of the Jewish people…finished in 15 days! In synagogues these five books are read, in their entirety, every year. When they finish and begin again, there is a service that includes lots of dancing and joyful music! I wish I could include some dancing and joyful music here for you today—we’ve accomplished something! I suspect “we’ve accomplished something” is what Moses was trying to say to the Israelites in his long poem blessing them—there’s been accomplishment and also there’s a lot of work still to do. I have to admit, I feel bad for Moses—he worked so hard, brought these people so far, stuck with them and prayed for them even when they were so annoying and whiney, and now his reward is to look but not touch the Promised Land. Poor guy. 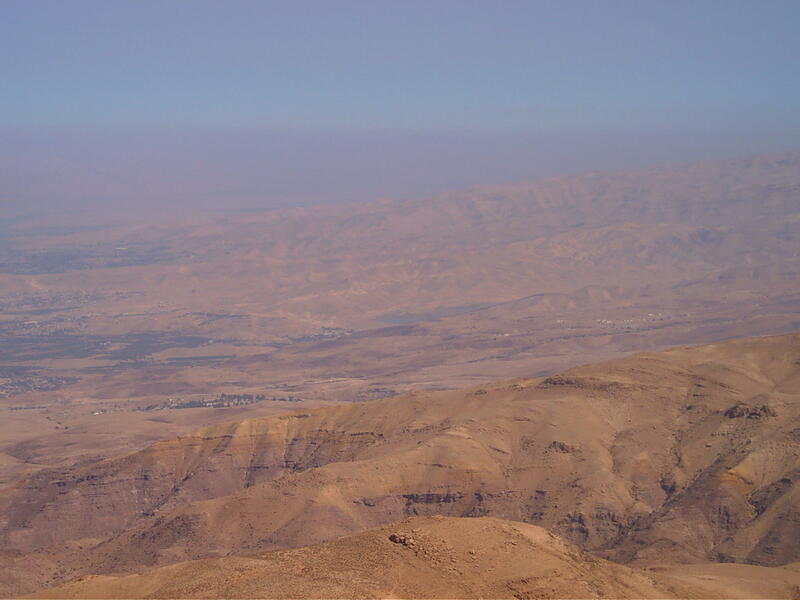 I don’t have a lot to say today that I haven’t said about Deuteronomy already, so I’ll leave you with views of the Promised Land from Mount Nebo, where Moses looked in. I also have a picture of the memorial tomb of Moses—declared so by the Pope!—even though Deut. 34.6 says “and no one knows where he is buried, to this day.” heehee! 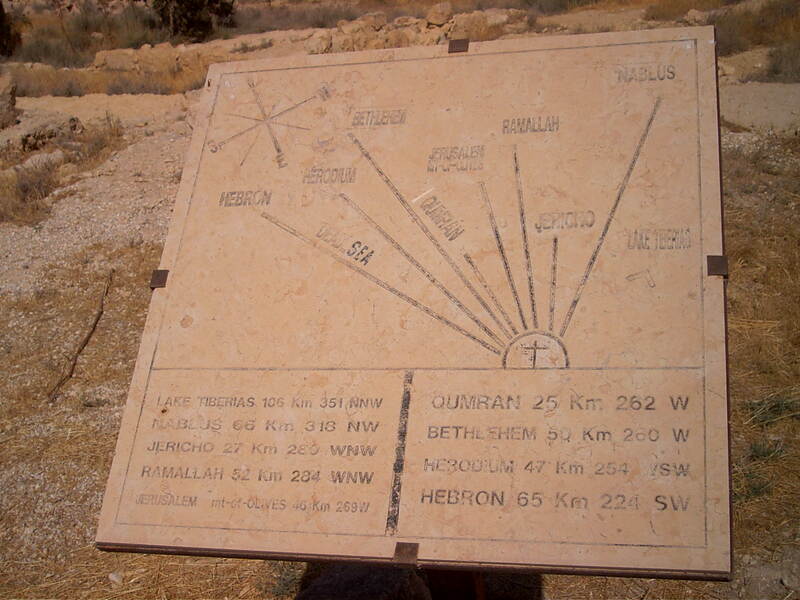 There is a chapel on the top of Mount Nebo, with beautiful mosaic floors. Here…take a look! This is a view of the Promised Land from Mt. Nebo, looking south-west. That’s the Dead Sea on the left. Here’s the view looking west, toward Jericho. 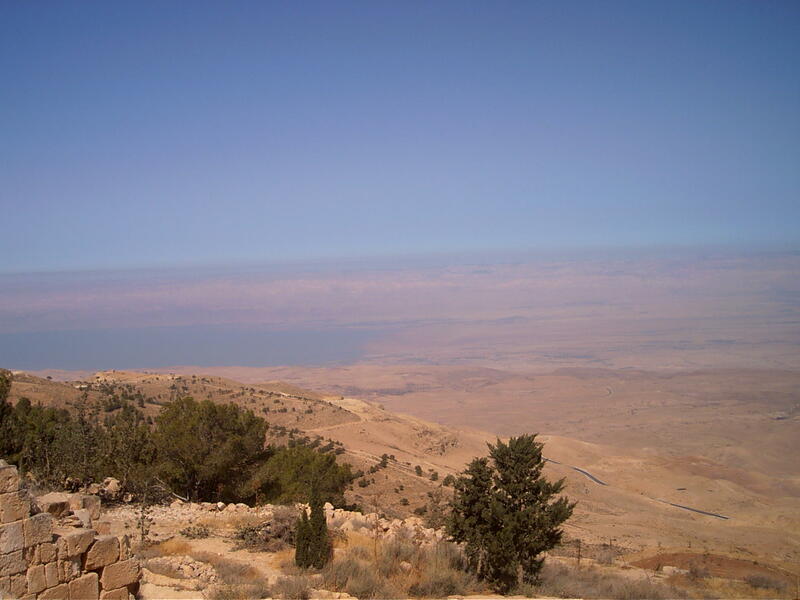 Here’s the view to the north, looking toward Galilee. Today I am feeling a little sluggish about writing about Deuteronomy. I wonder if, when Moses told the people all this stuff, he had any idea it would be written down along with all the stuff he’d already told them, thus making for several iterations of nearly the same material? It is interesting to think about the different contexts in which Exodus/Leviticus/Numbers/Deuteronomy were written, and the times, and what the needs of the community were for having their community grounded. We’ll be back to thinking about that many times through this reading adventure—in the prophets, and especially the gospels. Anyway, what I noticed most from today’s reading was the repetition of phrases like “God’s treasured possession” and “children of the LORD your God” and “a people holy to the LORD” and words like “love.” It seems that Deuteronomy is very concerned with the community belonging to God, not the other way around (which would have been the case in some other communities in the area). It made me think of the way the covenant promises work too—the land is given to the Israelites but it doesn’t belong to them—it belongs to God. And then I thought of Archbishop Elias Chacour (a Palestinian-Israeli Christian, the archbishop of Galilee (among other titles)) who has written a book called We Belong To the Land. Not “the land belongs to us” but “we belong to the land.” It’s an interesting way of thinking. Our newest Presbyterian catechism is called the “Belonging to God catechism”—the first question is: “Who are you?” and the answer is “I am a child of God.” The second question is “What does it mean to be a child of God?” and the answer is “That I belong to God, who loves me.” I think these two questions are the heart of what Deuteronomy is trying to tell us. God loves us, we belong to God (in a very old-school kind of way—the covenant community is talked about as God’s “possession” and as something God has “redeemed” which means quite literally that God is the owner of the community), and our task is to love God back. While we don’t generally think about following the rules as a way of loving, Deuteronomy certainly does. These rules and regulations clearly show to the world who the Israelites belong to and who they are—what they do is a reflection of the God who owns them, saves them, and loves them. What are the ways that we, as a community and as individuals, show our holiness, our blessed-to-be-a-blessingness, our love to the One who owns, saves, and loves? photos are of Archbishop Chacour, speaking at the Church of St. John the Baptist in Cairo, and of a Christian-occupied house in one of the villages of Minya (in middle Egypt). both taken by TCP. Well, we are once again into that great biblical tradition of repetition. But first we get a couple of really good things in today’s reading: an itinerary for where the Israelites went between Egypt and standing on what is not the Jordan side of the Jordan river (here called “Transjordan” which was still part of the official name of the country until not-that-long-ago…nothing like western ethnoo-centrism!). Archaeologically and historically most scholars think that the vast majority of the 40 years was spent encamped, probably at Kadesh-Barnea (in the north of the Sinai/slightly south of modern Israel). But they still did quite a bit of walking around! Once we get into Deuteronomy, we start to read things that sound strangely familiar—though at least they aren’t (so far anyway) ritual laws about what to slaughter and how and when! This time it’s Moses’ farewell speech. I have to wonder how he remembered all of this to deliver this speech, you know! Apparently the many days on the mountain listening to God giving all the laws and instruction paid off, because Moses puts it “in his own words” (by saying “the LORD said this….so do it!”) and makes a pretty readable textbook for Israelite covenant life. He reiterates the history of Israelite life from Egypt until now, the basic laws, and even some geography issues. It’s pretty impressive, really. Today’s reading also includes the pivotal verse of the Old Testament (and maybe even the whole of Scripture): the Shema. In Deuteronomy 6.4 we read, “Hear, O Israel: The LORD is our God, the LORD alone. You shall love the LORD your God with all your heart, and with all your soul, and with all your might.” the word Shema, often translated “hear,” also means listen and obey. The people are to listen well, hear what is said, and obey. Obedience isn’t a popular word for us anymore, but it’s at the center of the covenant community’s life. The people are to bind the words on their hands, foreheads, and doorways—in other words, to keep them front-and-center at all times: Lord the Lord with everything you have, every part of your being and every part of your life. Moses will go on to explain how exactly that is to be done…and that’s for tomorrow! For today, I wonder how we go about binding God’s word to every part of our lives, keeping it front and center?